I love lasagna but it's a bit of a pain to make and dirties a sink full of dishes. Especially for what is a one pot dish. How do you keep all of the flavor of lasagna, still keep it in one pot, but eliminate the mountain of dishes? 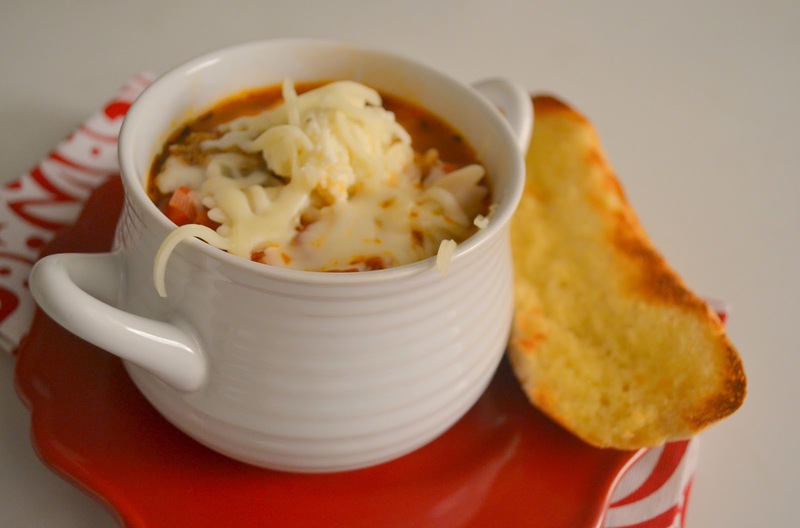 Lasagna Soup. Our winter weather has been anything but winter-like but this was still perfect to warm up with on a lazy Sunday. The prep is minimal and the list of ingredients lend themselves to adding and subtracting based on your preferences and what you have on hand. The only thing I would recommend, strongly recommend, not changing is the cheese topping. A blend of ricotta and mozzarella, a fat dollop on top melts into the soup and is truly what makes this soup taste and feel like lasagna. I wish I had added a quick grate of fresh nutmeg to the mixture and have added that note to the recipe. A quick chop of fresh basil would also up lovely. While the freakish spring like temperatures have been lovely, I'm really hoping for some snow soon. Lasagna Soup is a winner regardless of the weather. Enjoy! Heat olive oil in a large pot over medium heat. Add sausage, breaking up into bite-sized pieces, and brown for 5 minutes. Add onions and cook until softened, about 6 minutes. Add garlic, oregano, basil, and red pepper flakes. Cook for 1 minute. Add tomato paste and stir well to incorporate. Cook for 3 to 4 minutes, or until tomato paste turns rusty brown in color. Add diced tomatoes and chicken stock. Stir to combine. Bring to a boil and then reduce heat and simmer for 30 minutes. Meanwhile, put a large pot of water on to boil. Once boiling, add a teaspoon of salt to water and add pasta. Cook until al dente, according to package directions. Drain and set aside. While the pasta is cooking, prepare cheese topping. Combine all ingredients in small bowl. To serve, season soup with salt and pepper. Add some pasta to each serving bowl. Ladle soup over and top with a dollop of cheese mixture. Add cheese and serve. Lasagna soup sounds delicious! Thanks for sharing the recipe! I LOVE this idea...it sounds delicious!